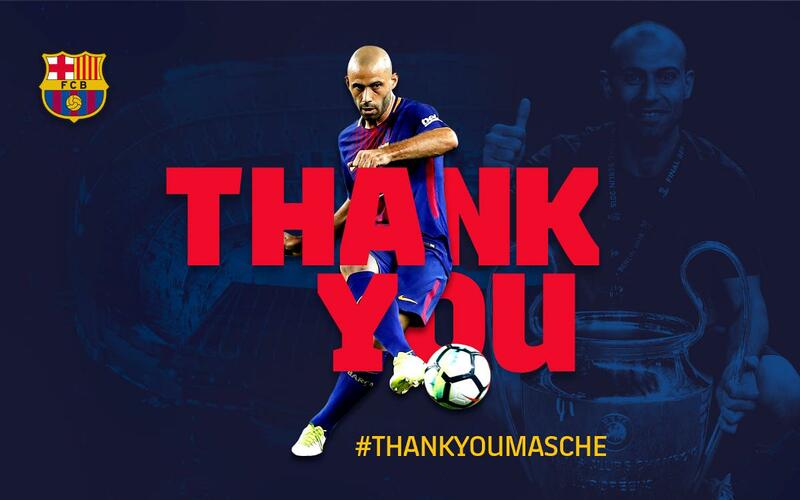 Javier Mascherano is leaving FC Barcelona after seven and a half seasons. The Argentinian will be receiving an institutional farewell from the club on Wednesday at 11.00am CET in the Auditori 1899, at an event that will be streamed on the club website. It will be attended by club president Josep Maria Bartomeu and the first team squad. Mascherano arrived from Liverpool and was presented to the fans and media on 30 August 2010. In seven and a half years at the club, he’s won 18 official titles as part of one of the most glittering eras in its history. He made 334 official appearances under five different coaches:Pep Guardiola, Tito Vilanova, Tata Martino, Luis Enrique and Ernesto Valverde. The first of those games was on 11 September 2010, a league fixture against Hercules at the Camp Nou. Although he was originally signed as a defensive midfielder, he was used at centre back to cover for the many injuries in that area of the pitch and did such a good job that he would go on to play just as often in that position as he did in the middle of the park. For example, it was at that centre back that he played in, and won, the famous Wembley final of the Champions League. There was something of an in-joke at the club about the fact that ‘Masche’, as his team-mates affectionately know him, had never scored a goal for the team, although attacking duties were never part of his game, so it should come as little surprise. All that changed in a game against Osasuna last season, when he was famously invited to take a penalty – and scored at last! Only thee foreigners have ever played more games for Barça than the ‘Little Chief’, namely Leo Messi, Phillip Cocu and Dani Alves.